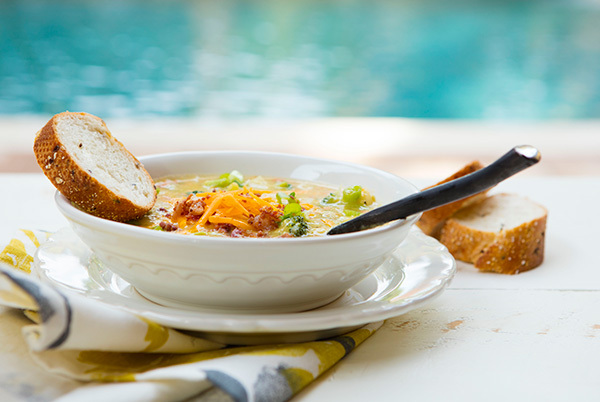 January has been unusually cool and rainy here in Florida this year, and this kind of weather always makes me crave a warm bowl of soup often. 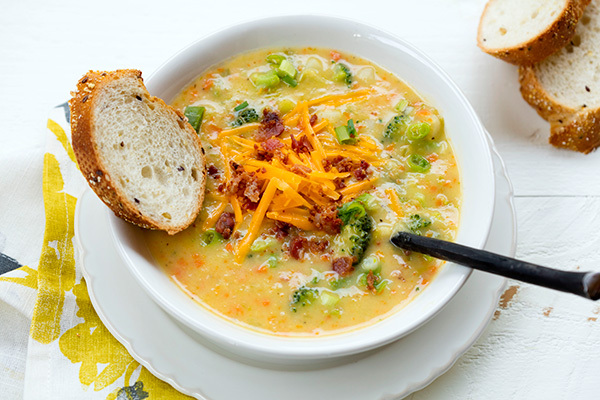 This month I have made lentil soup, a vegetable-packed soup, a pasta and bean soup, along with this creamy potato and broccoli soup. Potatoes are a great addition to “creamy” soups as they add thickness and body when blended giving the impression that cream has been added. 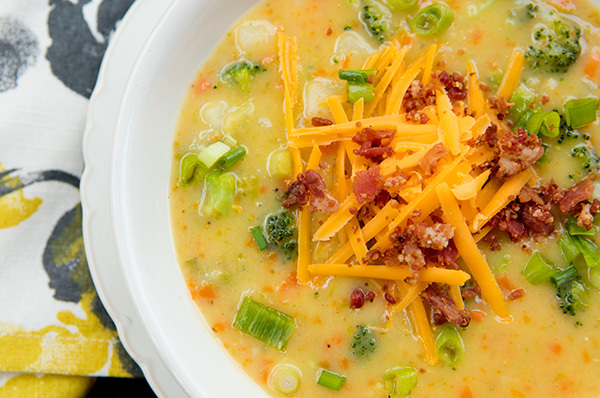 This soup is a take off of the popular loaded baked potato soup, but the addition of broccoli and other vegetables, along with the use of low-fat cheese makes it a much healthier choice. This soup is so hearty and rich, that along with some crusty whole grain bread and a crisp salad it can be served as a main course. 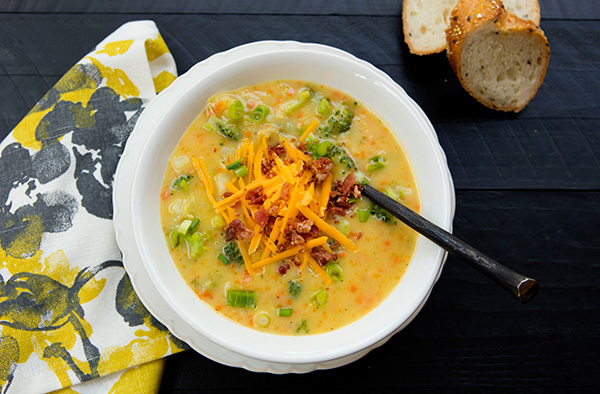 To garnish the soup, you can add toasted croutons, turkey bacon bits, chopped green onions, or some additional grated cheese. 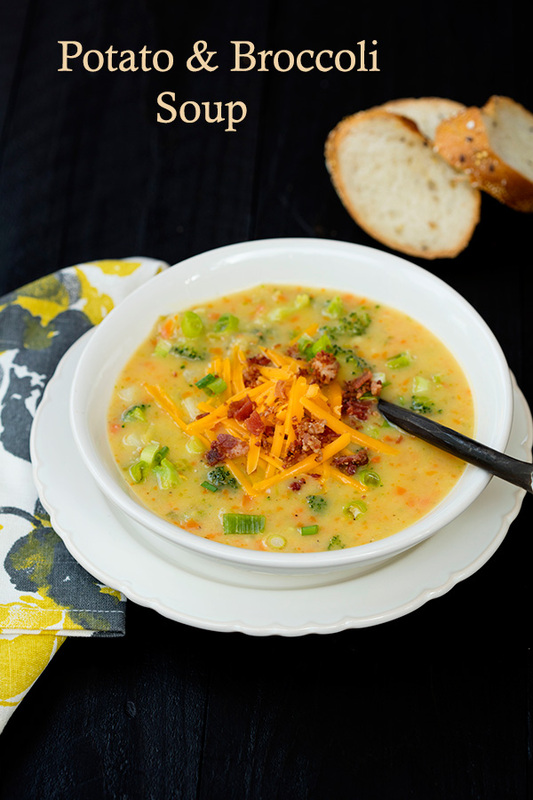 I use Russet potatoes in this soup as their starchy texture works perfectly in this recipe. Potatoes and just a little flour are used instead of cream are used to thicken the soup. Low fat cheese is used in this recipe to decrease fat calories. Place the oil in a stock pot and heat over medium heat. Place the onion, carrots, and celery in a food processor and pulse until finely chopped. Spoon the vegetables into the oil, and cook over medium heat, stirring often until tender, about 5 minutes. Add the flour, stirring constantly until mixed, then add the broth and potatoes. Bring the soup to a boil, then reduce to a simmer and cook over low heat until the potatoes are soft, about 10 minutes. Use a hand immersion blender (or blender) and blend about 1/3 of the soup until very smooth. Add the broccoli, two cheeses, salt and pepper, and stir to mix. Continue to cook over low heat until the broccoli is tender, about 5 minutes.